Let's face it, you're a busy person. Your small business needs communications systems that "just work." With Xact, you avoid the headaches of multiple vendors, configuring systems, troubleshooting problems - that's all included as part of our services to you. With our easy-to-understand Business-In-A-Box, your business gets the cutting-edge and professional telephone system you need to sound professional and get ahead of the competition. We also integrate employees and satellite locations, monitor your network for stability and security, and provide Unified Communications to all your coworkers. Business-In-A-Box integrates all the communications assets your business needs. A single Internet connection delivers everything you need for voice and data, including telephone system functionality. The features list is phenomenal, and with a price point per user ("seat") that is easy on your business' budget. Features such as Call Waiting, Call Park/Hold/Transfer, FindMe/FollowMe, Click-to-Dial, and administrative features that make setup and use of your phone system a breeze are all standard. Unified messaging, with voicemail converted to email, email notifications, and a network-based, centralized contacts database make handling your business in the office and on the road easy. Our US-based support team is friendly and knowledgeable about your services provided by Xact. And as your one vendor for phone, Internet, phone extensions, computer configuration, etc. it's a Simple Single Phone Call to reach a live person who can assist you with your issue. We can troubleshoot your network and other systems remotely, help you get back up and running, and even schedule with service providers in your area to correct any problems you have. Already our customer and looking for support? In short, we've been there and done that. 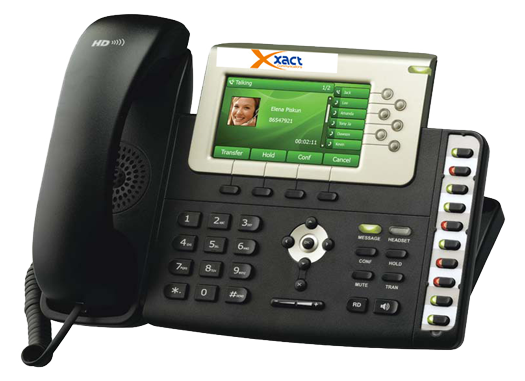 With all sorts of clients in all sorts of businesses, large and small, paired with our vendor status with several franchise businesses, Xact Communications is uniquely equipped to handle your communications needs.